What do you mean, It's not classical music? It's classic chocolate; same thing. Besides, a person has to have something to nibble on while listening to good music. Understand, I am not a chocolatier (I neither make nor sell chocolate) nor a chocolate authority (I do not profess to be an expert on the subject of chocolate or chocolate making) any more than I am a professional musician or musical authority. I am simply a person of a mature age who has spent a lifetime eating chocolate and listening to classical music. What you get here is exactly what you get with my music reviews: the opinions of one who loves the subject and has been lucky enough and lived long enough to experience a good deal of it. Now, a word about how to eat fine, dark chocolate. OK, I know that sounds pretentious, telling someone how to eat, but let me at least explain how I've learned to eat my chocolate. The first thing is not to eat too much at a time. Like anything really good, a little moderation is in order. I eat only a segment of a bar a day, meaning that a single chocolate bar might last me four or five days. Second, biting off only a small bit at a time helps, savoring the aroma and letting the candy melt on the tongue for maximum release of flavors. In other words, I do not advise gulping down an entire gourmet chocolate bar in a single sitting. Anyway, my list is nowhere near complete (there are only so many candy bars available to a person, even in a lifetime of eating), nor do I mean it to be anything like comprehensive. 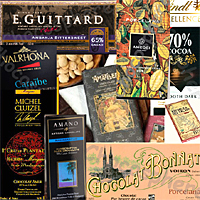 It is simply a starting place for considering the taste, texture, and fragrance of good chocolate. I've numbered my ratings from 1-10, the higher numbers indicating the more I liked the chocolate, with 5's and 6's being average and slightly above average. And I've rank ordered my list with the products I like most at the beginning. So, let's start. Finally, as I mentioned above, don't expect to find too many of these chocolate bar brands at your local supermarket. The best place to start looking is in your own locality for specialty stores and gourmet shops (google "chocolate shops" in your area). If you have to go on-line, the problem is that high shipping costs compound the high price of many of the bars. A ten-dollar chocolate bar could have a five-dollar added shipping charge. Nevertheless, you might check on Amazon (www.amazon.com), Chocosphere (http://www.chocosphere.com), or some such retail site. Fantastic Entry, Please keep updating it! I have been using it as a reference when I am out shopping for quality bean to bar chocolates. There is an amazing variety of dark-chocolate bars out there, and I try to sample as many of them as possible, usually a new one every week or two. Not that my taste will conform to everyone's, but I hope, at least, the article is informative. Have u tried Ecco brand dark butter bar? Its awesome! I meant Alter Eco salted brown butter. Sorry for prev incorrect name. I've tried to limit the scope of the survey mainly to dark chocolate bars. But I do like Alter Eco's dark bar.